Toasted Banana Caramel Sauce – sticky sweet and the perfect topping for fruit slices, graham crackers, pancakes, waffles or ice cream. Are you sick of making banana bread with your overripe bananas? Don’t throw them away! I’ve got another use for those black spotted beauties!! 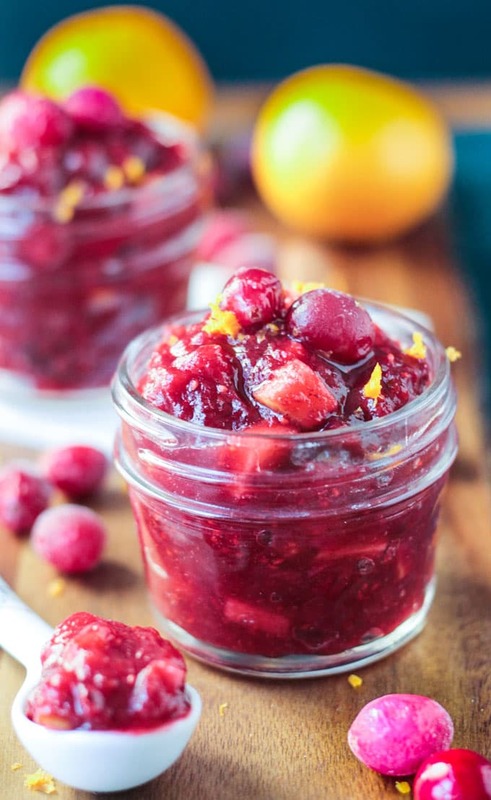 It’s sticky and sweet and you might want to make a double batch! 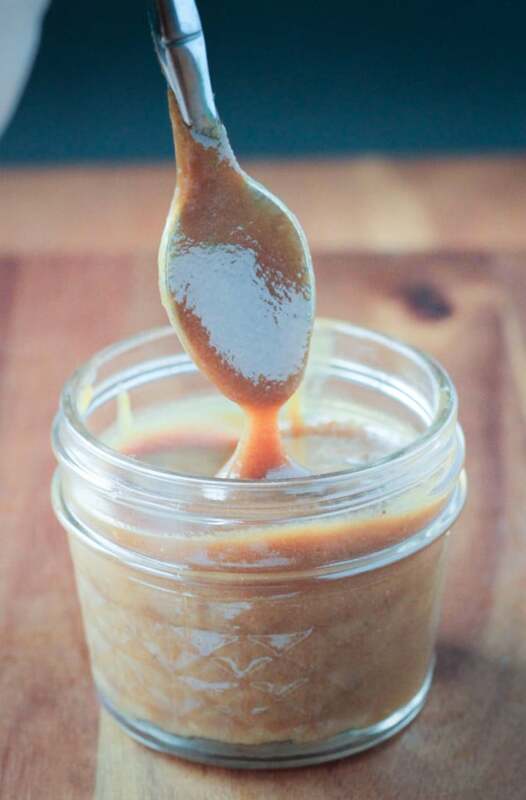 This Toasted Banana Caramel Sauce has my girls going crazy! 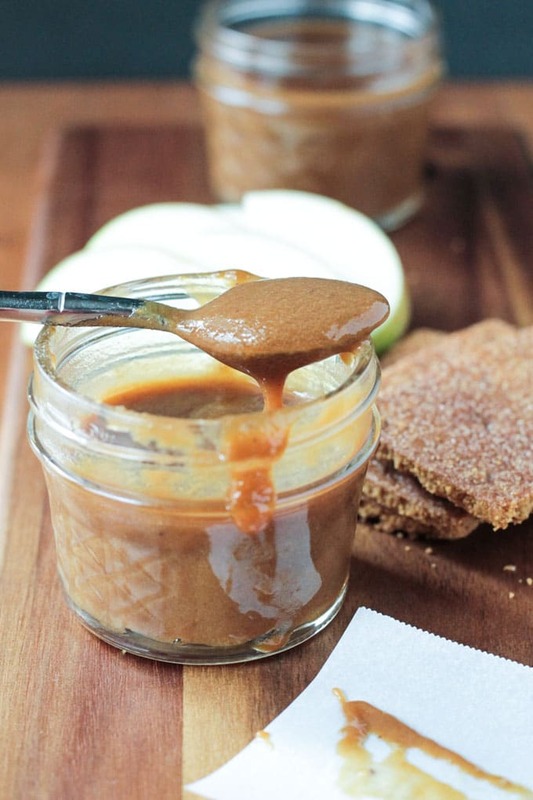 They are begging for apple slices just so they can dip them in this dreamy sauce. My initial use for this sauce was to top off our morning pancakes. It was such a huge hit, and devoured in record time, that I made another batch for dipping. I must admit, I did most of my dipping with a spoon! Now, I’m not going to lie to you and tell you that this particular caramel sauce will remind you of your favorite ice cream topping. This is not regular caramel sauce. It’s BANANA Caramel. If you don’t like bananas, you might want to try the Salted Caramel Sauce from my Apple Cinnamon Bread Pudding recipe instead. The sweetness of this sauce will depend a lot on the ripeness of your bananas. Ideally, your bananas will be dark and spotty…they are sweetest this way. You can get away with less added sugar if your bananas are super ripe. Never fear though, you can use just ripened bananas too, but you will likely need to add a bit more sugar. Now that I’ve made three batches of this ooey gooey goodness, I can assure you that it doesn’t matter what kind of milk you use. I used soy milk in the first batch, hazelnut milk in the second and almond milk in the third and they all turned out the same. I also tried thickening this several ways. 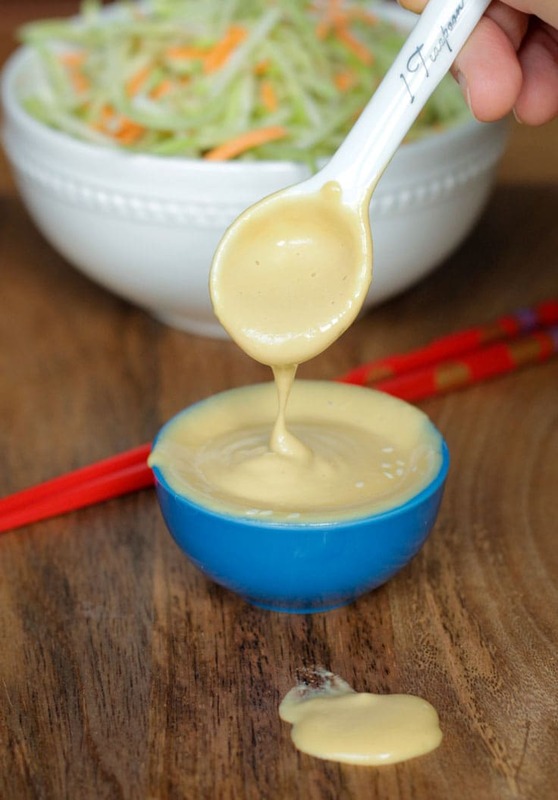 I didn’t like the texture tapioca flour gave this sauce…it was more gelatin like almost. I tried thickening it JUST by simmering it down, but it was still a bit too runny for my liking. So, I actually went back to the first thing I tried and that was brown rice syrup. Brown rice syrup already has the consistency of caramel sauce, so just 2 tbsp of this syrup helped to give this banana caramel the consistency I was looking for. You will have about 2 cups of this sauce after blending, but reducing it down will leave you with approximately 1 cup. Stay tuned for the pancake recipe that was the original vehicle for transferring this Toasted Banana Caramel Sauce into our mouths at record speed! 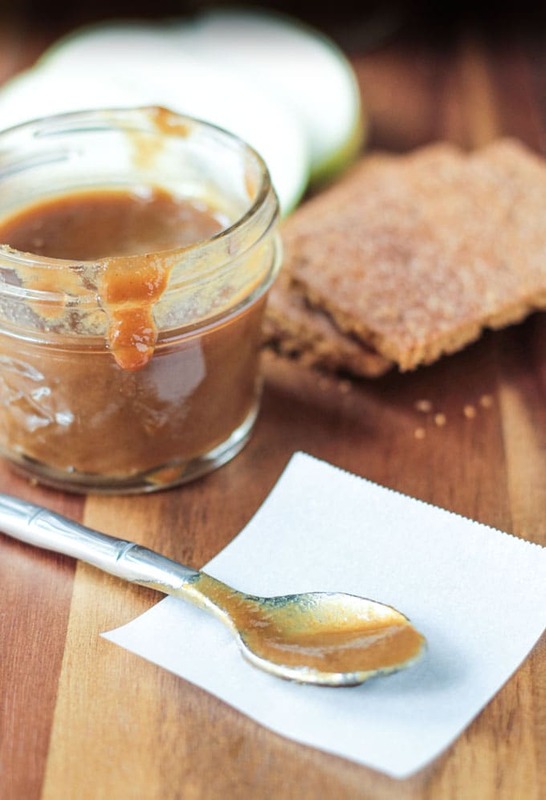 I hope you love this Toasted Banana Caramel Sauce as much as we do. If you try it, please come back and leave me a comment below with your feedback. You can also find me on social media. Be sure to tag @veggie_inspired and #veggieinspired so I’m sure to see it. Enjoy! This Toasted Banana Caramel is sticky sweet and the perfect topping for fruit slices, graham crackers, pancakes, waffles or ice cream. 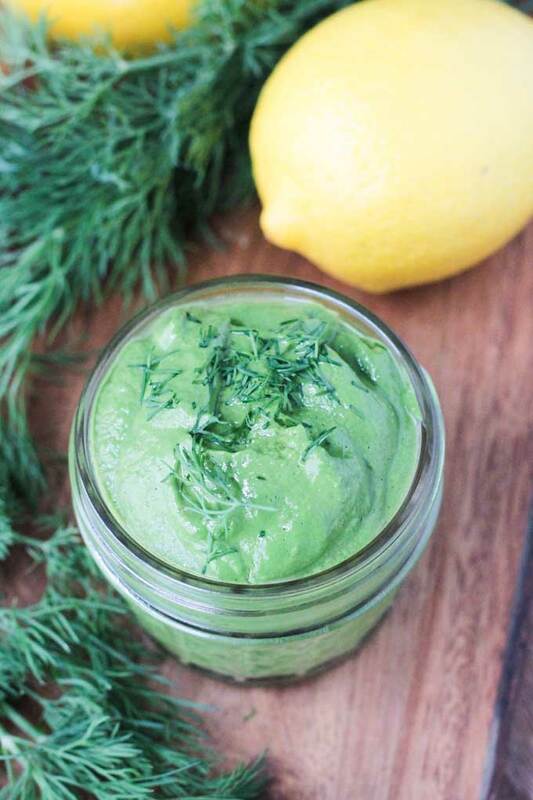 Place all ingredients in a blender or food processor and puree for a few seconds until smooth. Pour the mixture into a saucepan and bring to a boil. Reduct heat and simmer about 20 minutes, whisking often. You may need to adjust the heat as it simmers. You don't want the sugars to burn, but you do want a good bubble happening so that it reduces. The mixture will be ready when it's reduced by about half. This sounds riiiight up my street. Probably injected into some doughnuts. Sounds fantastic. Yum! This sounds so delicious 🙂 I’ve never thought of using bananas in a caramel sauce before, but sounds scrumptious. Thanks, Tina! I’m again staring at a counter full of dark bananas. Time to make some more!! Oh, thank you! I hope you love it! Please come back and let me know how it turned out after you give it a try!! I realized I never commented on your post, catching up on your posts! This looks so creamy and amazing! Even though I don’t like bananas, my daughter and hubby LOVE them and I know my daughter would go crazy over this! Will have to make it for her! Great idea! Thanks, Brandi. Yeah, this is definitely not for the banana haters out there, but I hope your daughter loves it! I *may* have tried that…you know, for research purposes. 🙂 Thanks, Sarah! This sounds really cool! I have never thought of using banana to make a sauce. As you said, a great way to use up the ripe bananas. Love it! Thanks, Lok! It’s pretty tasty. I hope you give it a try! This is SO clever! I always freeze my overripe bananas for smoothies but I’m going to pin this for the next time so I can make something a little different. Love it! Thanks, Katie! I’ve got a freezer full too. 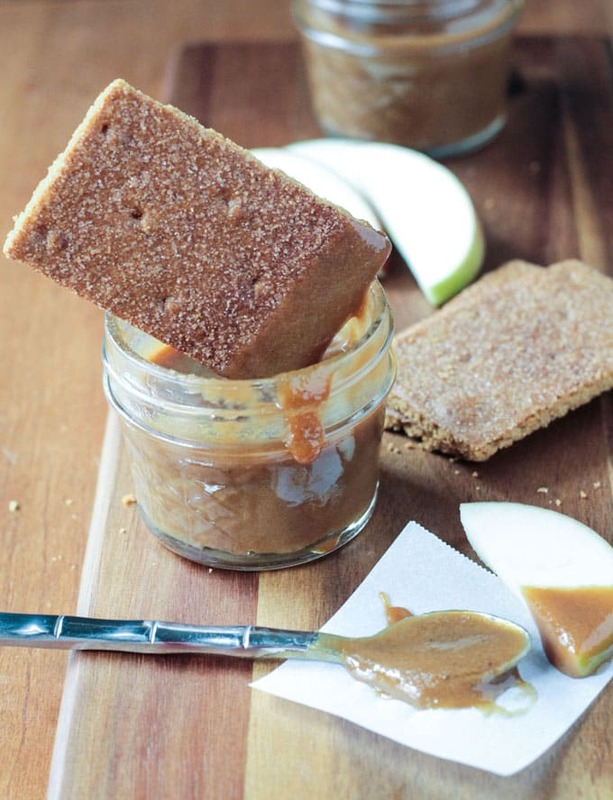 I love the combination of caramel and banana, and I love the sweeteners you use in this! Thanks so much, Mary! Enjoy! This looks totally amazing! Banana and caramel compliment each other so perfectly.I can totally see this drizzled all over a stack of my banana and walnut pancakes! Mel! I need the recipe for your banana and walnut pancakes!!! STAT! Yes!! That sounds amazing, Mel!! Aw, thanks, Annie! I appreciate your kind words! You had me at banana. Quality ingredients too! Love it. This looks terrific Jenn! I never make caramel and got to try this! Thanks, Derek! I hope you enjoy it! I actually never made anything caramel. Banana and caramel sound great combination. I am going to try this one. Thank you for sharing. Thanks, Shiho. If you like bananas, this is a wonderfully sticky sweet sauce! this is literally a masterpiece, just when i thought caramel sauce couldn’t get any better, i see this beauty!!! Thank you so much!! And it’s so easy! Love!! Caramel sauce everywhere huh?! I could just live on caramel…I’m thinking I need to grab a straw. Woah! I love this idea! I’m constantly shoving overripe bananas into the freezer in the hopes that they’ll eventually make it into some baked good. Next time I am definitely making up a batch of this instead! Yup, me too, Alissa! My freezer is sooo overstocked with bananas that I just had to do something else with them. It was a winner! Thank you!! What a fun idea!! This sounds like the perfect dip for apple slices. I have tons of ripe bananas in my freezer for smoothies, but I think they’re gonna get co-opted! Thanks, Cadry! We can’t get enough. I’ve been making pancakes JUST so we can top it off with this sauce! HaHaHa! I love it! Thanks so much! And I just finished my pancakes…sans this amazing sauce!! Toasted and caramel and o….sweetness! Oh and are those graham crackers in the pic? If so what brand do you get? Yes. They are Trader Joe’s brand and they do contain honey. For some reason, I thought they were on TJ’s Vegan List and I didn’t read the ingredients until I got home (silly me!). After I discovered they contained honey I went on a googling rampage to try to find cinnamon grahams that were vegan and have come to the conclusion that you have to make your own. There are actually quite a few recipes online for homemade ones and they don’t seem too difficult. I’ve done that too before, darn honey just sneaks in all sorts of places. I really wish someone would make some without, I know I can make them but sometimes I’m lazy 😀 Or just want to make a graham cracker crust and don’t feel like baking before I bake haha. Thanks for the info though! Thanks, Natalie! Brown rice syrup makes the best caramel corn too!! I keep meaning to put up a recipe for that and always forget. I always use it to hold my granola bars together. I have a freezer filled with damn overripe bananas. I can only handle making so many banana muffins so this is a welcome suggestion. And it looks positively wonderful. Thanks Jenn. Thanks so much, Monica! My freezer looks the same. I purposely buy more bananas than I know we will eat so I can stock my freezer for smoothies, breads, muffins, etc. But, yes, sometimes, as wonderful as those things are, you just need something different! Let me know if you try it! I bought the brown rice syrup and I’m defrosting the bananas overnight!! Tomorrow is THE day! WooHoo! I posted the pancakes that we poured it on TODAY! I hope you enjoy!! My friend just PMed me on Facebook and said she’s halfway through making this but it looks a murky grey colour?!? Thoughts Jenn? Hmmmm, mine was definitely caramel brown every time. Did she sub anything? I guess color doesn’t matter if it tastes good, but I’ve definitely never had it turn gray. Jenn my friend said she used raw sugar instead of coconut sugar. I, however, *puffs out chest* made a batch and it’s a glorious deep caramel colour. I’ll never make a food stylist but WOW does it taste mighty fine!!! And much easier than I thought!